In this episode, Martha demonstrates how to pan-sear, a technique that produces consistently satisfying — and quick — meats and fish. Pan searing involves browning food quickly over high heat so it develops a nice crust and locks in the flavor and juiciness. 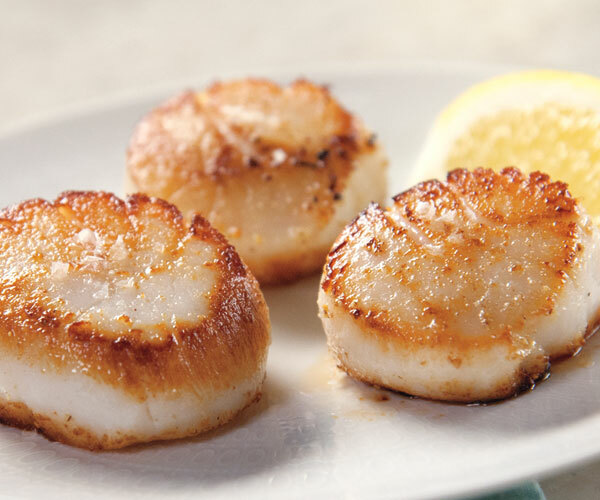 Martha shares her technique for pan-seared scallops with lemon-caper sauce. She also offers recipes for crisp-skinned salmon filet, pan-seared steak with mustard-cream sauce and Muscovy duck breasts with a port-wine reduction. Martha Stewart shares some thoughts on pan searing. Learn about pan searing from Martha Stewart. This pan seared strip steak recipe has a delicious mustard cream sauce. Both components of this dish have very few ingredients. Martha Stewart makes this pan seared strip steak recipe in the "Pan Searing" episode of "Martha Stewart's Cooking School." Heat a 10-inch cast-iron skillet over medium-high heat until it is very hot but not smoking, about 2 minutes. Pat steaks dry with paper towel. Season steaks on both sides with salt and pepper. Add half the butter to the skillet and set one of the steaks directly on top. Repeat with the remaining butter and steak. Without moving the steaks, sear until steaks release easily from pan and a golden brown crust has formed, about 4 minutes. Using tongs, turn steaks over and continue cooking until an instant-read thermometer reaches 115 to 120 degrees for rare, 125 degrees for medium-rare, and 135 to 140 degrees for medium. Transfer steaks to a warm plate to rest. Remove pan from heat and carefully pour in vermouth (it will spatter). Return skillet to heat. Deglaze pan, stirring up any browned bits with a wooden spoon and cook until liquid is almost completely reduced, about 45 seconds. Add the cream and any juices that have collected from steak, and stir to combine. Stir in mustard and heat for 15 seconds. Cook until sauce lightly coats the back of a spoon, about 10 seconds. Season with salt and pepper. Place the steaks on dinner plates and pour the sauce over, dividing evenly, before serving. This pan seared strip steak recipe appears in the "Pan Searing" episode of "Martha Stewart's Cooking School." Visit the episode guide to watch a preview and get a cooking tip.